The CEL-712 Microdust Pro uses a laser diode-based light-scattering sensor to instantly detect dangerous concentrations of airborne particles and aerosols in the workplace. It can be used independently to measure material processes or filter performance, or to capture release events such as bag breaks. It can be paired with a cyclone, filter cassette and sample pump for size-selective or gravimetric monitoring. The OLCT 80 Wireless field detector and transmitter monitors oxygen and combustible, toxic and refrigerant gases in remote locations. It reduces installation costs by eliminating cabling and wiring. It also includes an infrared remote controller and on-board display, flameproof or intrinsic-safety sensors, and a design suitable for explosive areas. The Multi-Gas Clip multi-gas detector is a portable instrument featuring two-month continuous run time without requiring a battery recharge. 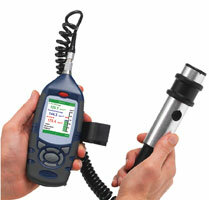 It is easy to use with single-button operation, and the recommended calibration frequency is every six months. It uses a low-power infrared sensor for the detection of combustible hydrocarbon gases. 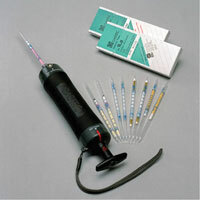 This line of Gastec pumps and detector tubes precisely measures gases and vapors in more than 600 applications, making them invaluable tools for gas detection and measurement, as well as detecting leaks and fugitive emissions. 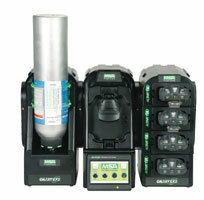 Gastec pumps are easy to use and have one-stroke piston action that provides reliable operation with no partial samples. The Galaxy GX2 Automated Test System efficiently manages your portable gas detection fleet through simple, intelligent testing and calibration of ALTAIR and ALTAIR PRO Single-Gas Detectors and ALTAIR 4X and ALTAIR 5X Multi-Gas Detectors. New Link Pro Software offers proactive safety management and significantly reduced total cost of ownership through reduced calibration gas usage and faster testing times. The Draeger X-am 5100 portable single-gas monitor was specifically developed for the detection of hydrogen fluoride/hydrogen chloride, hydrogen peroxide or hydrazine reactive gases. The special design of the monitor prevents reactive gases from depositing on the housing (gas adsorption) and ensures direct gas entry to the sensor, fast sensor response times and precise measurement results. The Tango TX1 single-gas monitor features a three-year run time and patent-pending DualSense Technology to increase worker safety – regardless of bump-test frequency – while reducing overall maintenance costs. The Tango can detect carbon monoxide, hydrogen sulfide, sulfur dioxide and nitrogen dioxide. It is powered by one replaceable 2/3 AA lithium battery.